ADK introduced five new high-end multipattern FET condensers last year. All five microphones use similar circuitry: a single stage JFET with an Oxford (OEP) output transformer. All five microphones offer a switchable 3-way pad and 3-way filter. But wait — if the mics all use similar circuitry, why are there 5 of them? Most of the tone of these mics, indeed of any mic, comes from the capsule. ADK’s capsules are modeled after familiar vintage sounds. The same capsules are used in the 3-Zigma line of hybrid mics. You might remember our extensive review of the CHI modular mic system from a few years back. I think these large-diaphragm capsules are the most interesting part of the ADK/3-Zigma story. Designing a good microphone capsule is not easy, even when classic Neumann and AKG capsules are readily available for analysis. But ADK took a slightly different route, choosing not so much to mimic the sound of the original capsules, but rather to reproduce the sound of the classic microphones that hosted these capsules. Just about every capsule foundry in the world has their own version of the K67 capsule, but none of them sounds like the ADK GK-67. Why? Because the GK-67 capsule doesn’t try to sound like a K67 capsule, but rather like the U 67 microphone. We thought the best way to illustrate the sonic differences between these capsules was with a female vocalist. YouTube star Lauren O’Connell is one of my favorite female vocalists. 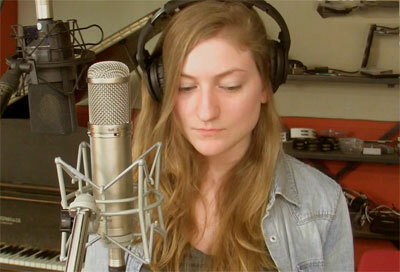 She agreed to test the five ADK T-Fets, and compare them to her go-to vocal mic, the Neumann TLM-103. She performed a verse and chorus of her song “I Belong To You,” originally released via Youtube as a duet with Ryan Lerman. See the original video below. Update, January 2017 – we have taken the audio samples offline. I set up a Pro Tools session with gain-matched vocal tracks, and locked the guitar track so that I could easily solo each vocal mic in a loop. You can download the PT session here [54 MB ZIP file]; make sure Pro Tools’ “Solo Mode” option is set to X-OR so that you can flip between mics with one click of the appropriate Solo button. The Vienna mic (C12 voicing) is closest to the TLM-103. Both are glossy, bright, airy, shimmery. The highs are boosted, but pleasing. Although in a blind test I’d have a hard time distinguishing these two mics, there were passages where the TLM-103 seemed to break down and distort on plosives, while the Vienna remained solid and smooth. The Cremona (Ela M 251 voicing) and Hamburg (U67 voicing) are more neutral than the Vienna and TLM-103; both lack that shimmery top end. On Lauren’s voice, these two sounded very similar; the Cremona had just a bit more energy in the highs, but it’s a subtle difference — something you’d appreciate more if a singer was sibilant in the range where the Hamburg has an attenuated response. 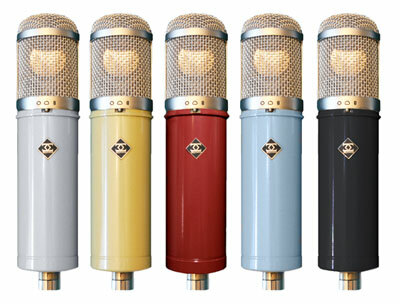 The Berlin (U47 voicing) and Frankfurt (M49 voicing) seem like the most colored of these mics, because the mids are boosted. You’ll hear the effect if you solo the Vienna a few times, then switch to the Berlin; the latter sounds, for a moment, bandpassed, with the highs rolled off and the mids pushed forward. The Frankfurt is a sonic hybrid of the Berlin and Cremona voicings; it has the forward mids of the Berlin, although not so pronounced, with some of the air of the Cremona, although not so pronounced. The Berlin would not be my choice for Lauren’s voice, or maybe not for any lead female voice. But it might be great on background singers, as this frequency curve tends not to stand out in a mix. (Conversely, I wouldn’t use the Vienna or TLM-103 on background vocals, for exactly the same reason.) In these tracks, the Berlin, and to some extent the Frankfurt, sounds slightly two-dimensional as compared to the others. Lauren likes the TLM-103 because it helps her voice cut through the mix. I appreciate the clarity of that mic, but it wouldn’t be my top pick. I think the Vienna mimics the tone of the TLM-103 but beats it in smoothness. But even then, it’s not my favorite. Listen to the line near the end of the chorus, “don’t know where such souls go;” both these bright mics accentuate the sibilance of the vocal in a way that I think detracts from the song. But I admit that I’m sensitive to that sort of thing. My favorite mic for Lauren’s voice is the Cremona, with the Hamburg a close second. Every time I solo the Cremona track, I get a feeling of relief, like ahh, that’s what her voice is supposed to sound like. The Cremona was the smoothest and most pleasing to my ear; it has plenty of clarity and definition, a nice round tonality, and most importantly, nothing pokes out at me. I am impressed by these mics. They’re solidly built, made with high-quality parts (yes, I looked), and the finish colors on the production microphones are among the best I’ve seen on any microphone anywhere. The 3-way pad and filter options, and 3-way polar pattern, make these mics extremely versatile. When used on Lauren’s voice, I don’t hear five radically different voicings from these five microphones. But the two extremes of the Vienna and Berlin are easily identified, with the Cremona and Hamburg somewhere in the middle. There are subtle coloring variations that stand out if you listen closely, even on this single source. Other voices, and especially instrumental sources, would exhibit the distinctions between these microphones more clearly. I wish we’d had the bandwidth to hear these on additional sources. Larry Villella of ADK likes to think of microphones like paintbrushes. I don’t use that metaphor, but I share his belief that a well-equipped mic locker has many different sonic colors in it. Every session has different needs; if all your mics sound the same, then your collection isn’t serving you as well as it should. Said another way, microphones are EQ devices. Kudos to ADK for providing some distinct new choices. We thank Larry and ADK for the long-term loan of the microphones, and Lauren O’Connell for her fantastic help in recording these demos — which are remarkably consistent in timing, volume, and phrasing from one take to the next. Hear Lauren’s song, “I Belong to You,” in its entirety, just below. Buy the CD that contains it, Quitters, directly from Lauren’s website ($10 FLAC download for instant gratification). 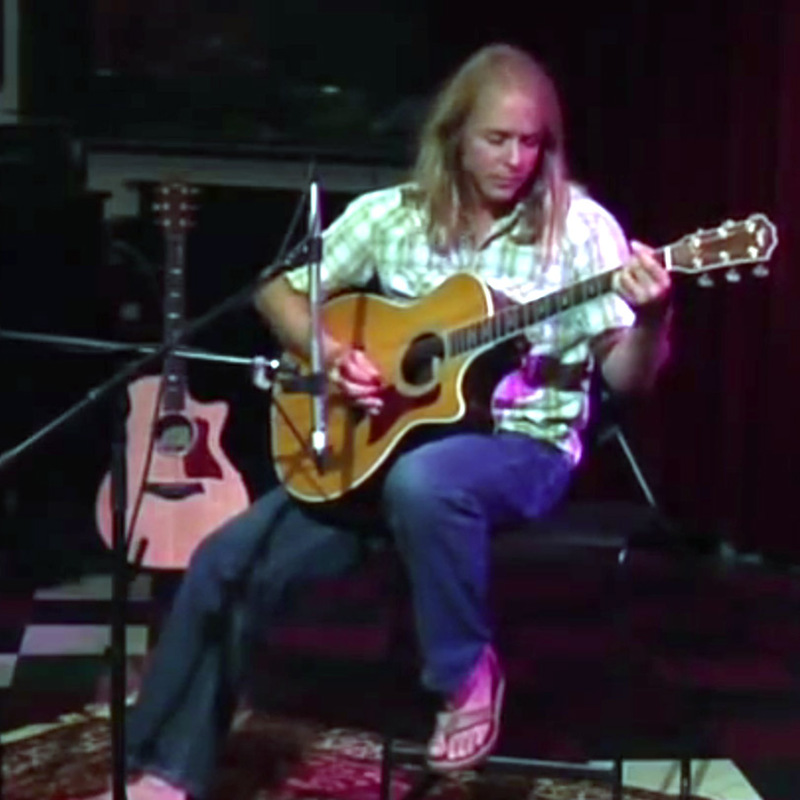 Find out more about the Custom Shop T-fet microphones from ADK. I’ve got the Berlin, and as it sounds here, it has a meatiness and authority that gives everything an extra emotional weight. I get how it isn’t the right feel for this song, but I can’t say I don’t like it on her voice! Thanks for the shootout! Although it would be nice to hear them in front of a drum kit or male singer, it’s a good sampling of the different colors in these mics. I am torn between two of these mics. I chose #2 the Berlin and #6 Cremona, the Cremona is creamy, the Berlin has a presence which pop’s in my head phones (ATH-M50’s from Audio Technica and Beyer DT 770 pros). The Neumann TLM 103, my least favorite, too sharp, emphasizes mouth noise, highs brittle with an overall sterility. I have often thought the TLM 103 sounds like a cleaner Chinese mic. Value and sound wise, ADK has something for everyone here! By the way, listened to the whole version of Lauren’s song, great, absolutely great! Wow they all sound really good. Even my “least favorite” ones still had much that I liked about them. Great mics overall. Like you Matt, I’m really digging the Cremona. Your description and opinion of it are equal to mine. I’ve been on a quest for a killer female vocal mic in this price range and the Cremona is now a top-contender! I’m looking for something that’s really smooth and controls sibilance, since most condenser mics give me nothing but trouble like that TLM-103 does on her voice. You destroyed the sound of these mics and you are misrepresenting them here. It boggles the mind how you could literally not be aware of this? How could you be that bad at hearing? It’s so strange. I don’t understand. Just listen to how distorted the word “Lines” is during “Use those lines” in the samples. Can’t you hear? How could the TLM 103 and the ADK mics *all* exhibit the same exact nasty cheap distortion behavior on the same words? Because you screwed up and your chain is broken or something. I have a TLM 103 and it doesn’t sound like that. I’ve owned ADK mics and they don’t sound like that either. Sounds terrible. Whoever recorded this cannot be trusted because they discredit their basic ability to hear. Matt, another great review. And more great mic’s from Mr. Villella. I have a collection of the 3 Zigma CHI mic’s and capsules because of your review of them. I also own one of his Z Mod tube mic’s, the Z47. Now that you’ve covered the FET’s, I hope you’ll review these marvelous mic’s so others will know what excellent tools they are. @Barsktiajla, sorry to have ruined your day by posting a couple audio samples on the internet! I don’t hear “nasty cheap distortion” in these samples. Lauren’s raw tracks were peaking at -15dB, so it doesn’t seem like the signal chain was compromised. Isn’t it possible that what you’re hearing is part of the performance? I enjoy the ADK microphones. I thought the 12 style mic has some sibilance issues. I thought your favorite the 251 style mic has too much low end, but that could be filtered out. They are not perfect, but they are good. I thought Lauren was right, the TLM-103 gives a pretty good representation of her voice.